As the last shipments of 2015 begin their journey to children in remote corners of the world, it’s a good time to reflect on what our Wool-Aid community has given to children this year. Many of you have donated warm, wool handknit/crocheted items, and you and your family and friends have supported our shipping fund with financial contributions. Every contribution is appreciated, and every contribution makes a difference to a cold child somewhere in the world. For the sake of the children, please consider making a tax-deductible year-end gift to support this important work. Your donation will help Wool-Aid provide the gift of warmth to children living in extremely cold environments who have the least access to resources. Let us join together to conclude 2015 with a message of hope and ensure that 2016 continues to bring warmth to the children that Wool-Aid serves. Thank you for your support, and Happy New Year! 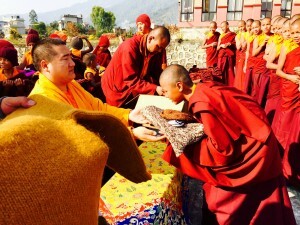 Wool-Aid items are beginning to arrive in Nepal for distribution. 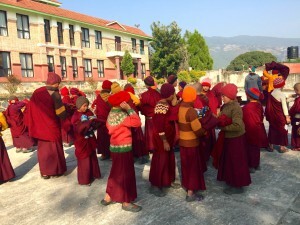 We have shipped 23 boxes to Nepal so far, some containing items specifically in colors for the young monks, and some in a full range of colors for distribution to needy children in remote villages and elsewhere. 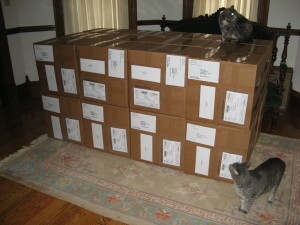 Not all of those boxes have been received yet — it takes a month, and sometimes much more, for our boxes to reach them. Additional boxes will be shipped to help warm the children this winter. 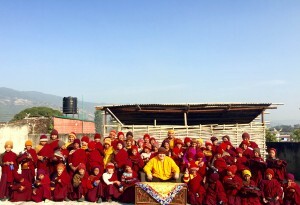 Heartfelt thanks for all your loving contributions for the young monks in Nepal!